We had several threads about winter-female-crews recently. And WG stated in their pre-Christmas video and articles that female crews have no expiry date. And the other type, the blonde ones, are those from personal missions. Is this just another WG feature? I received it today, first time. I dont wanna to contact support, because I dont enjoy automated answers and those guys are mostly useless. Got this msg too, anyone knows more about? Please refer to the announcement threads where it's been repeatedly mentioned that Christmas crew will not move, Twitch crew will as per the recent announcements also. If it will not be removed, then why this message is showing up? Edited by BONNe_LV, 14 February 2019 - 07:58 AM. The message is technically correct. Which if you speak computer says they will not be removed. It just needs a small exception routine writing to suppress the will be removed part, or change it to will not be removed. Please learn how to crop images. The Lord eekeeboo helps those who help themselves. Could I crop it? yes. Did I want to? no. 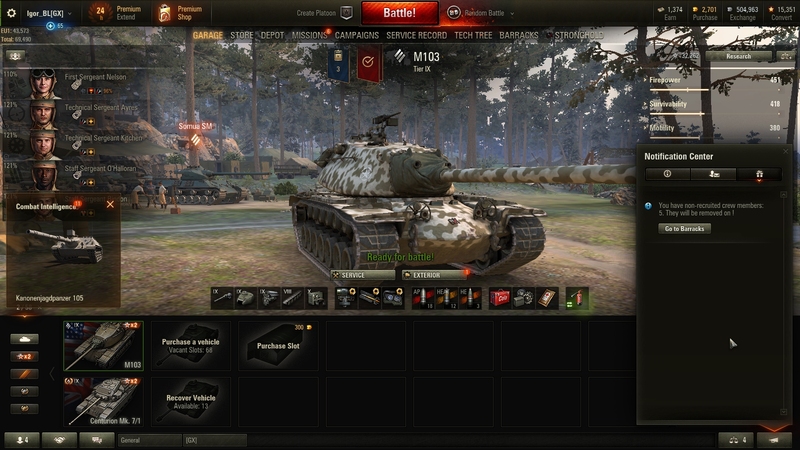 I wanted to show my perfect m103 in behind. So live with it. yes, it was repeatedly mentioned and we still get notification like this. It wouldnt be the first time for WG to says one thing and does another. Like "Halloween bonuses apply on all game modes" while they dont. And you buy the 13th level, and get no refund or anything.... Because "wg didnt meant them to work in all game modes, it was article+video mistake". I have no twitch crews. in the end, i sent ticket to support, because nobody answered here. Support "invites me to ignore the notification". It is obviously a bug. ​There's no way for me to link ALL the posts this has been shared on, there have been that many. It was announced in the Christmas event AND in the thread talking about 1.4 coming. I made sure I answered repeatedly in both. Yeah well everyone is still being told that they will be removed on. With an exclamation mark. ​And then answering them they aren't, and people still ignore it! Why the notification that says they will get removed? Why players need to choose what to believe? WG CC, ingame notification, articles, YT videos...? Edited by Igor_BL, 14 February 2019 - 03:50 PM. It's not like all players of this game hang out on the forums to see what you guys have to say in case someone asks the question. But everyone that plays the game are being told this every time they start the game. And if you change server then you get the notification again. It's getting hammered in quite hard. It only takes a teeny weeny bit of intelligence to look at the message and figure out it's a false alarm. "They are giving me this notification every time I want to play, but it's WG so it's probably nothing" sounds like a reasonable stand and all for the seasoned cynic but it's not really where we want to be, now is it. It should be enough to just play the game (as I assume the vast majority are). Having to browse forums, portals, social medias and what not to see if their notifications are wrong is just bad. And bad is bad. what is the best way to get the max of female crew? Put them in the kitchen? what about that?? Are those from campaings in danger?